First ever diesel hybrid showcased by VW. Since the late 1990s, we have seen a slew of hybrid vehicles enter the market with Honda and Toyota leading the way. Other manufacturers including Ford, GM, Chrysler, Hyundai and Kia have jumped in, while the German companies have chosen to stay out of the market, concentrating on advancing diesel technology instead. The Volkswagen Group appears ready to open things up, by fielding its own version of a hybrid powertrain. 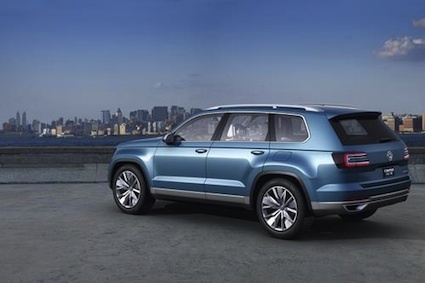 At the 2013 North American International Auto Show in Detroit this month, Volkswagen is displaying its CrossBlue Concept, a six- or seven-passenger SUV that marries diesel and electric technologies. If built, the CrossBlue would be positioned between the Tiguan and Touareg, its two other SUVs. 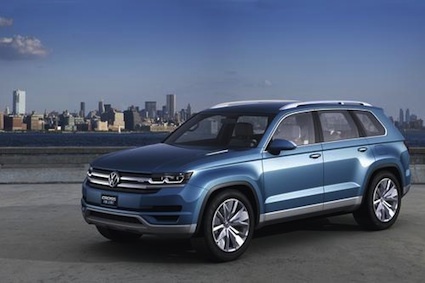 Occupying the midsize range the Volkswagen CrossBlue might shake things up if it goes into production as a hybrid. Under the hood, a 190-horsepower turbo diesel would offer range extending power, kicking in after 14 miles of drive on electric mode only. That engine makes 295 foot-pounds of torque and with the assistance of two electric motors one in the front making 133 foot-pounds and one in the rear making 199 foot pounds of torque this passenger vehicle would serve up a net 516 foot-pounds of torque. Working in tandem with the diesel-electric system is a six-speed dual clutch transmission. Estimated 0 to 60 mph times are just 7.2 seconds with ample torque on hand to ensure that you and your riders can tackle any open road challenges with ease. To squeeze out more energy, you can also dispense with the raw power and operate this vehicle in Eco mode. In Eco mode, just one touch of a button on the shift lever the electrical system operates at minimal capacity. You’ll still be able to access the climate control and throttle map, but power will be curtailed. Choose the sport mode and you will have access to full power. Other modes for off-loading, charging and EV-only are also included. The Volkswagen CrossBlue Concept has all the design characteristics of the brand, resembling more of a minivan than a crossover. Indeed, with the Volkswagen Routan soon to be discontinued, the Volkswagen CrossBlue or something much like it could fill the void. The seating layout is 2+2+2, with each passenger sitting on individual seats. An optional seventh place seating position can be gained by swapping out the middle row seats with a three-place bench seat, enabling the CrossBlue to match the standard passenger capacity of todays minivans. Both the second and third row seats can be folded, to provide 83.5 cubic feet of storage capacity. Perhaps the most notable feature of the Volkswagen CrossBlue is its estimated 35 mpg when operating in diesel model and 89 mpge when operating in electric-only mode. With its 18.5-gallon fuel tank, this vehicle has a 661-mile driving range or far enough to travel from El Paso to Dallas without refueling. The Volkswagen CrossBlue was joined by another VW concept at the NAIAS. That second vehicle was the Passat Performance Concept, a five-passenger sedan featuring a specially modified version of its 1.8-liter turbocharged gasoline engine, making 250 horsepower and paired with a six-speed automatic transmission. VW says that the engine is already used in European and Asian markets. The concept Passat sits on upgraded 19-inch wheels and features Bi-Xenon headlights, and advanced front lighting system, LED tail lights carbon style inserts inside. This vehicle offers leather seating and a special suspension system. Expect that this vehicle will go into production, as Volkswagen keeps up with such auto trends as offering a performance midsize sedan to complement other Passat models. Volkswagen CrossBlue photos courtesy of Volkswagen of America, Inc.